The Saint Vincent dePaul Society is an international organization headquartered in France, founded by St. Frederic Ozanam. Our parish St. Vincent de Paul is a part of that worldwide outreach, organized as a parish conference of the Youngstown Council of St. Vincent dePaul. Its purpose is to reach out in charity, in the spirit of St. Vincent dePaul, to those experiencing some financial need or in some crisis situation in our area. Help is provided on a person to person basis. Unfortunately the conference is not equipped or financed to provide long term care. 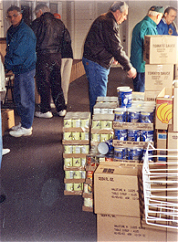 The Saint Vincent dePaul parish conference established a food supply pantry in 1958. Its objective is to provide accessibility for parishioners and others with dispatch and anonymity. Every second weekend of the month, except for February, there is a second collection taken up to assist the St. Vincent dePaul Society in their mission of serving the poor and the hungry. For information or help, call the parish office at 330.792.3829, leave your number, and an “on-call” member of the Saint Vincent dePaul will contact you personally to discuss your situation.